Additionally, HITAEC and HCAEC (also obtained from Cell Applications, Inc. but derived from the athero-prone human coronary arteries) were subjected to microarray analysis. Twenty-nine genes were found to be expressed differently between HITAEC and HCAEC; one of them (TES) was shown to be downregulated in patients with coronary artery disease, resulting in increased monocyte adhesion, endothelial cell motility and transendothelial migration of monocytes. (Click to Enlarge) Human Internal Thoracic Endothelial Cells: HITAEC (L) immunolabeled for vWF (green) and CD31/PECAM (red) (M). Nuclei visualized with PI (red) (R). Miles, B., I. Zakhary, A. El-Awady, E. Scisci, J. Carrion, J.C. O'Neill, A. Rawlings, J.K. Stern, C. Susin, and C.W. Cutler. 2014. Secondary Lymphoid Organ Homing Phenotype of Human Myeloid Dendritic Cells Disrupted by an Intracellular Oral Pathogen. Infect. Immun. 82:101-111. Colter, D., C. Buensuceso, C. Kazanecki, and A. Gosiewska. 2012. 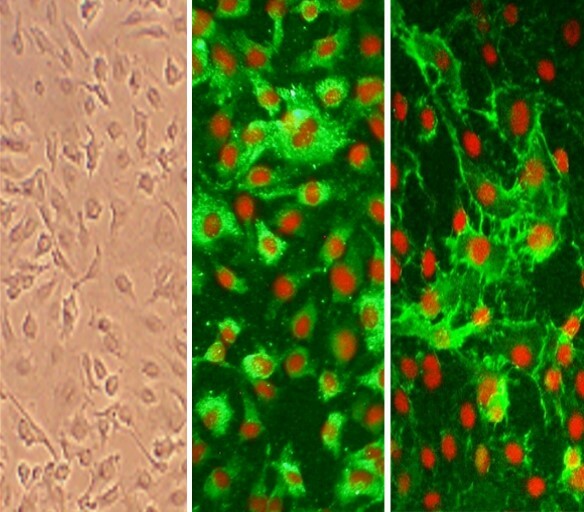 Mammary artery derived cells and methods of use in tissue repair and regeneration. Patent US 8323972 B2.